As the grip of winter loosens, several shrubs burst into bloom, foretelling the promise of the coming spring. Here are three shrubs that flaunt their colors very early, before azaleas come into full bloom, then fade into the background for the rest of the year. These are also deciduous, meaning they will be bare sticks in the winter. Use them sparingly, strategically placing them so that when they are not in bloom they do not dominate the scene, but in spots where they will be easily seen attention getters. 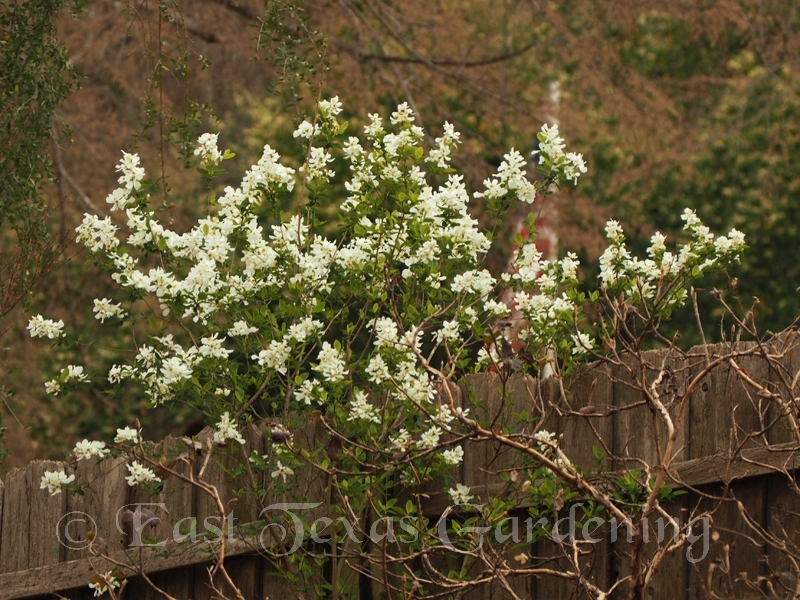 Pearlbush (Exochorda) – When I first moved to Tyler, there was a scattering of these large shrubs along a fence line not far from my home. They stood out like a pearls on a black dress – abundant pure white blooms when little else is in bloom and deciduous trees and shrubs had barely begun putting on the green. The common name comes from their buds, swelling like pearls before opening up into a good sized 5-pointed star. 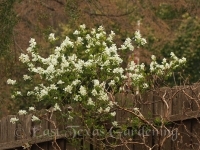 This is an old-fashioned, large, open (even floppy), uprightshrub that does not have much redeeming qualities when not in bloom, but is worth a spot in the right place in any garden. There are some recently introduced varieties with reportedly larger blooms, andmore compact growth habit. Proven Winners has a couple, including Blizzard and Snow Day® Surprise (both hybrids which would account for improved characteristics). 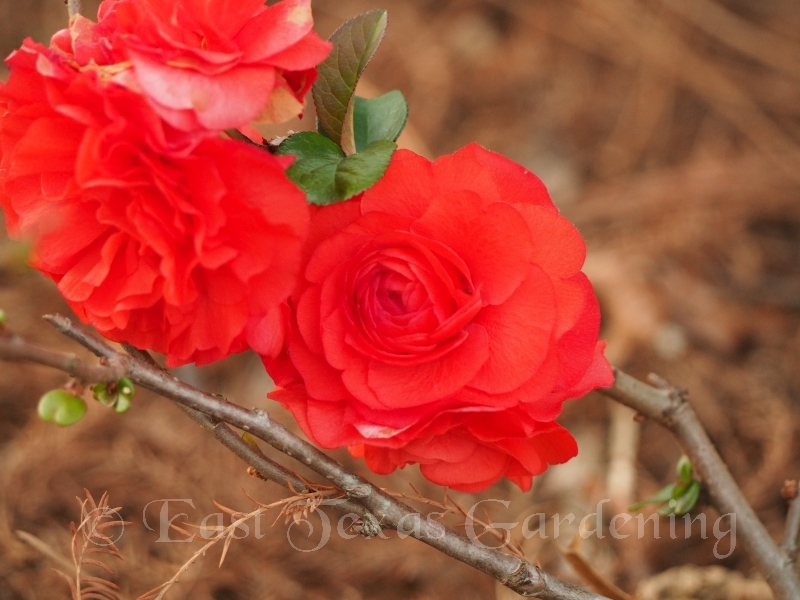 Pearlbush prefers slightly acidic soil and blooms best in full sun, though it will do fine in partial shade, but will have a more lanky growth habit. Flowering Quince (Chaenomeles japonica) - Here’s a common, old-fashioned shrub that lights up a yard in very early spring. 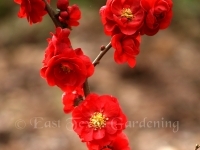 A thorny, upright, densely branched shrub growing up to 6 -8 feet tall,flowering quince blooms, like Pearlbush, on previous season’s growth. 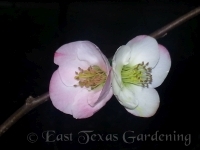 Often called simply quince or japonica, this tough shrub is covered with showing blooms, with varieties of several colors including ‘Texas Scarlet’, ‘Cameo’ (apricot pink),’ Apple Blossom’ (white to light pink),’ Snow’ (white, of course – also ‘Jet Trail’), ‘Toyo Nishiki’ (several colors on same plant). They are great for floral arrangements, with closed and open buds lasting easily a week or more in the vase. A few years ago, thanks to the wonder ornamental breeding program at North Carolina State University, a new group of hybrid flowering quince varieties were developed and introduced as the Double Take series. There’s Scarlet Storm, Orange Storm and Pink Storm. The outstanding feature of these varieties is the enormous double blooms that cover the stems, almost looking like roses. Other characteristics are their compact growth habit, and they are thornless. These are worth a prominent place in your yard where they can be easily viewed when in full flower. 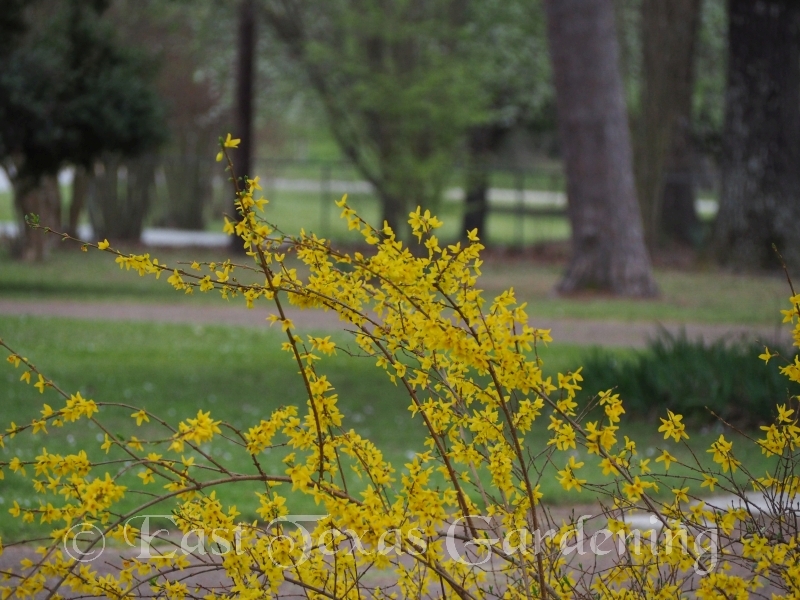 Forsythia – this is the classic early yellow blooming shrub with flowing, arching branches. The bright yellow flowers shout “Spring is coming”! After bloom, the plant recedes into the background. 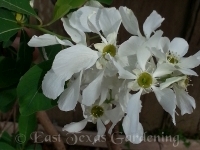 Like many other ‘old standbys’, breeders regualry develop, select and introduce improved varieties of most ornamental plants, so check out what’s available, do a little research, and make your picks. 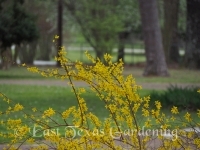 Forsythia is used as an indicator plant in cooler regions of America for timing of application of weed control products to prevent crabgrass, according to Dr. Matt Elmore, Texas A&M AgriLife Turfgrass Specialist in Dallas. Whether that is an accurate indicator for us in the south needs to be confirmed, but forsythia blooms should serve at least as a reminder that crabgrass will be blooming soon. While these shrubs are fading in their glory by mid-March, there’s plenty of time to plant any of these into a choice spot in your yard. Beware, however, of bareroot bargains. These would be plants with roots wrapped in plastic, often already budding out. Purchase well-rooted container-grown plants to ensure success establishing the plants in your yard.